Caroline Easton’s clinical work and research take her to dark places where addiction and family violence paint ugly pictures. Easton, a forensic clinical psychologist, has recently joined the College of Health Sciences and Technology from Yale University School of Medicine Department of Psychiatry. She is the first faculty member in RIT’s newest college to be hired from outside the university. She will help build a program in clinical psychology with a forensic emphasis and will collaborate with external partners at Rochester General Health System/Behavioral Health Network, University of Rochester Medical Center Department of Psychiatry, Monroe County Criminal Justice System and Monroe County Office of Mental Health. 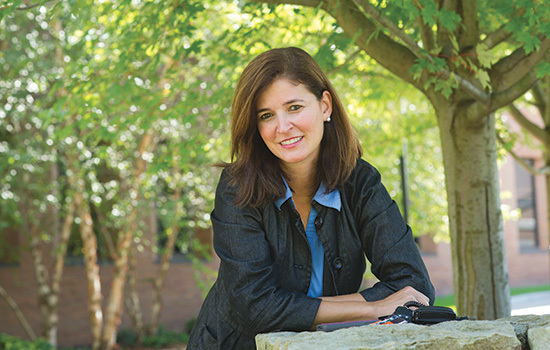 Easton, an alumna, earned her bachelor’s degree in biotechnology with a minor in psychology in 1990. She received doctoral degrees in psychology in 1994 at University of Connecticut and re-specialized in clinical psychology at University of Massachusetts, Amherst, in 1997. Easton returns to Rochester as a seasoned forensic psychologist and expert witness who is frequently called upon to testify about the role, if any, drugs played in a crime. In 2003, Easton created the Forensic Drug Diversion Clinic at Yale, where she focused her research on addiction, violence and crime. Her therapies have had positive outcomes in reducing clients’ aggression and helping them to manage their anger and abstain from drug use. Easton rejects the idea of treating substance abuse in a vacuum. She links drug and alcohol use to the bigger picture of family conflict and/or intimate partner violence. The reliance on ineffective treatment models for aggression and substance abuse frustrates Easton, whose integrative approach looks at the whole individual. Easton connects the failure of standard generic therapies to the increased number of clients referred to her clinic in New Haven, Conn., during the last decade. Easton’s alternative therapy is attracting international attention. Psychologists in Brazil and Great Britain, as well as in the United States, are adopting her model for treating individuals with co-occurring substance abuse and domestic-violence issues.